The origin of these troughs on Vesta has puzzled scientists. The complexity of their formation can’t be explained by simple collisions. New measurements of Vesta’s topography, derived from images of Vesta taken by NASA’s Dawn spacecraft last year, indicate that a large collision could have created the asteroid’s troughs. But, this would only have been possible if the asteroid is differentiated – meaning that it has a core, mantle and crust — said Debra Buczkowski of the Johns Hopkins University Applied Physics Laboratory in Laurel, Md. There are other qualities of Vesta that could be clues to how the troughs formed. For example, unlike the larger asteroid Ceres, Vesta is not classified as a dwarf planet because the large collision at its south pole knocked it out of its spherical shape, said Buczkowski. It’s now more squat, like a walnut. But if Vesta has a mantle and core, that would mean it has qualities often reserved for planets, dwarf planets and moons — regardless of its shape. 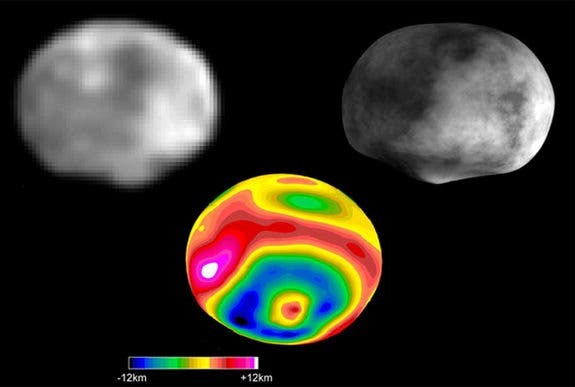 Image at the top of page shows the southern side the asteroid Vesta and a huge crater taken by the Hubble Space Telescope (top, left), as a reconstruction based on theoretical calculations (top, right), and as a topological map (bottom).